Reading and share top 12 famous quotes and sayings about Bosnian by famous authors and people. Browse top 12 famous quotes and sayings about Bosnian by most favorite authors. 1. "...while hiding in plain sight in Belgrade, undercover as a New Age mountebank, Karadžic frequented a bar called Mad House - Luda kuca. Mad House offered weekly gusle-accompanied performances of Serbian epic poetry; wartime pictures of him and General Ratko Mladic, the Bosnian Serbs' military leader (now on trial in The Hague), proudly hung on the walls. A local newspaper claimed that, on at least one occasion, Karadžic performed an epic poem in which he himself featured as the main hero, undertaking feats of extermination. Consider the horrible postmodernism of the situation: an undercover war criminal narrating his own crimes in decasyllabic verse, erasing his personality so that he could assert it more forcefully and heroically." 2. "In Bosnian, there's no distinction in literature between fiction and nonfiction; there's no word describing that." 3. "But history does matter. There is a line connecting the Armenians and the Jews and the Cambodians and the Bosnians and the Rwandans. There are obviously more, but, really, how much genocide can one sentence handle?" 4. "WHITE AMERICANS HAVE A VERY UNUSUAL SENSE OF HISTORY. They make it up as they go along, constantly revising to suit their tastes in a manner that would make Stalin blush. 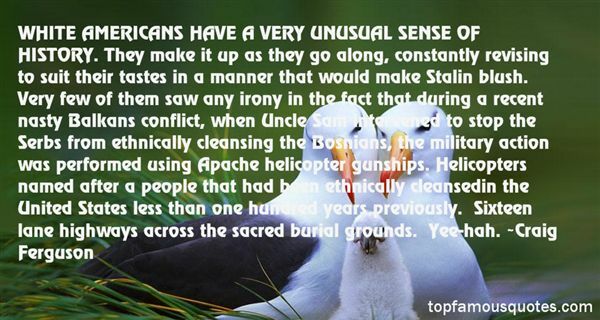 Very few of them saw any irony in the fact that during a recent nasty Balkans conflict, when Uncle Sam intervened to stop the Serbs from ethnically cleansing the Bosnians, the military action was performed using Apache helicopter gunships. Helicopters named after a people that had been ethnically cleansedin the United States less than one hundred years previously. Sixteen lane highways across the sacred burial grounds. Yee-hah." 5. "I am a living illustration of Bosnian mixing and converting. My grandparents lived in eastern Herzegovina. Very poor. The Turks came and brought Islam. There were three brothers in the family. One was Orthodox Christian. The other two took Islam to survive." 6. "Sarajevo was this beautiful city, very cosmopolitan, multiethnic, full of wonderful people, artists and writers and poets and Serbs and Muslims and Croats, and living side by side. And then this medieval siege, and it was a medieval siege, came, and the Bosnian Serbs were on the hills lobbing in rockets and grenades and mortars." 7. "I had my life threatened by Bosnian Serbs on numerous occasions." 8. "For me the much more significant question is what did the Americans do, if anything, to help the Croatian army, because they are the ones that changed fundamentally the map of Bosnia, not the Bosnian army." 9. "I was with the U.N. Secretary-General Boutros Boutros-Ghali on the day that Srebrenica fell, which happened to be a huge historical turning point in the Bosnian war." 10. "I've had much nastier things said about me in the British press than in the Bosnian press." 11. "Hypocrisy, double standards, and "but nots" are the price of universalist pretensions. 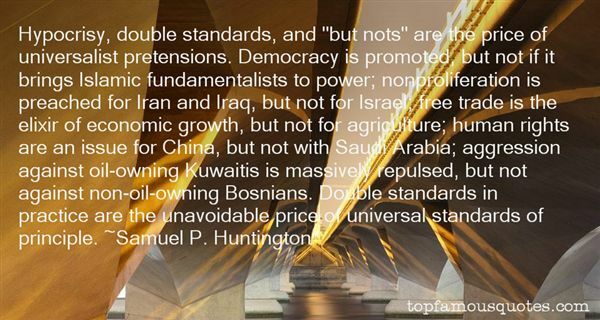 Democracy is promoted, but not if it brings Islamic fundamentalists to power; nonproliferation is preached for Iran and Iraq, but not for Israel; free trade is the elixir of economic growth, but not for agriculture; human rights are an issue for China, but not with Saudi Arabia; aggression against oil-owning Kuwaitis is massively repulsed, but not against non-oil-owning Bosnians. Double standards in practice are the unavoidable price of universal standards of principle." 12. "Europe has another meaning for me. Every time I mention that word, I see the Bosnian family in front of me, living far away from whatever they call home and eating their own wonderful food because that's all that is left for them. The fact remains that after fifty years, it was possible to have another war in Europe; that it was possible to change borders; that genocide is still possible even today." My biggest error? Something that is to happen yet."